We are always putting out content on digital marketing tactics for SEO, PPC, Social Meida, Email Marketing and Analytics, but the truth is we really are a Content Marketing Agency. Our Definition of a content marketing agency is one that creates content based on research and strategic principles that generate awareness, drive more traffic, leads, form submissions, phone calls, new customers and revenue. We are a Really Good Content Marketing Agency! Many agencies, especially here in St. Louis, can write and publish content while calling themselves content marketing agencies, but the truth is, they are rarely strategic and virtually none of them have the deep discipline experience to effectively utilize a multi-channel strategy that will drive results. Good Content Marketing delivers results. The goal is to ultimately obtain new customers through the strategic exposure and knowlege share that content marketing lends. Greater visibility, More Traffic, More Leads, Form Submissions, Phone Calls and Revenue. This is the goal. 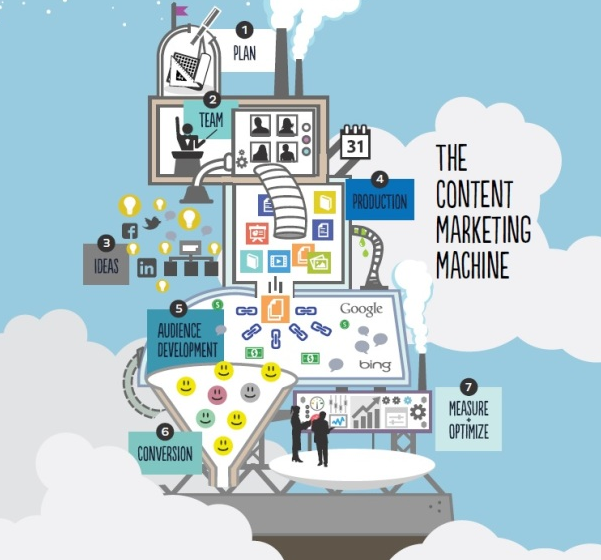 We approach content marketing from a very technical position. First, we get to know a company at it’s core. Then focus on the why, the how and the what. This allows us to perform meaningful research into the behaviors of users and potential customers around strategic topics and terms. We then perform a content gap analysis to identify what content does exist or needs to exist on your website. The modification of the existing content and addition of the missing content is outlined and implemented. We then monitor, analyze and recommend tweak or additions thereafter to continously optimize the content marketing efforts. There are a TON of agencies in the St. Louis area that call themselves digital marketing firms, content marketing agencies or marketing agencies and try to do the strategic work, but this needs to be handed over to the pros the digital marketing technologists and analysts that know the tools, tactics and research methodologies. Mentioned alot here in this article are “St. Louis Content Marketing Agencies” or Marketing Agencies in general, but we actually have phenomenal clients from all over the united states and are working on global campaigns for a couple of our domestic clients. We just want to be clear in giving examples of what we actually do and what other agencies say they do. Plus we Love St. Louis and rep this city pretty hard! We are on 24/7. Accessibility, transparency and getting things done is what we do all of the time. There is no such thing as too early or too late for us! If you want to work with the Best St. Louis Content Marketing Agency or learn more then please contact us by phone or by filling out the form on this page and we will speak with you very soon. SEM, PPC, Paid Search, AdWords or whatever you call it is a pretty mature channel with many tactics that you can find outlined anywhere online. But most people don’t give any creative ideas that can help bring massive value for you or your company. Below we have listed 3 Creative ideas / tactics that you can use in your SEM Strategy. Use remarketing to display unappealing ads so visitors WILL NOT click on them and then view the report to see where ads have been shown. This is useful because it gives you a deep understanding of where else your website visitors go online, what other topics are they interested in, what sites could you be partnering with or advertising on, etc. To see which websites, videos, and apps have displayed your ads from your Placements tab. Sign in to your AdWords account at https://adwords.google.com. Click the Campaigns tab and select your campaign. Click the Display Network tab. To see where your ad appeared based on your other targeting methods, including keywords, topics, interest categories, remarketing, and demographics, look at your automatic placements. Click the “See details” drop-down to see a list of site URLs where your ads have shown. Most people bid on terms and phrases that have a high probability of converting immediately. 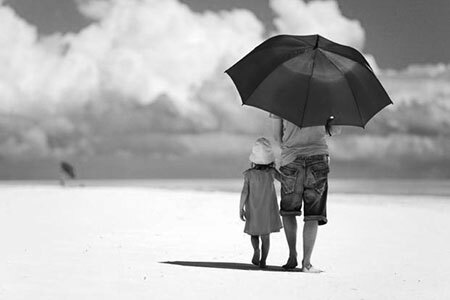 Move people into your funnel at all points and then nurture them into becoming customers. Get them to buy again! Costs doing this are only incrementally higher compared to the normal way, but will increase your sales volume and your SEO visibility, because more people find your useful article and will potentially link to it after reading it. Make this a part of your content marketing strategy! Now that we can upload email lists to AdWords using Customer Match it is very easy to know who your ads are being presented to. This will allow you to confidently tell people to not click on your ads, but When they do, the content will be 100% relevant for them. Why tell them to not click on your ads? Because it will make them want to click on your ads! Just think about the last time someone told you not to do something, it’s 100% safe to say that you immediately thought, “I’ll do that if I want to!” and it makes you want to. This will increase your Click Through Rate and ensure this known audience sees your message. Google released a paid search update recently. 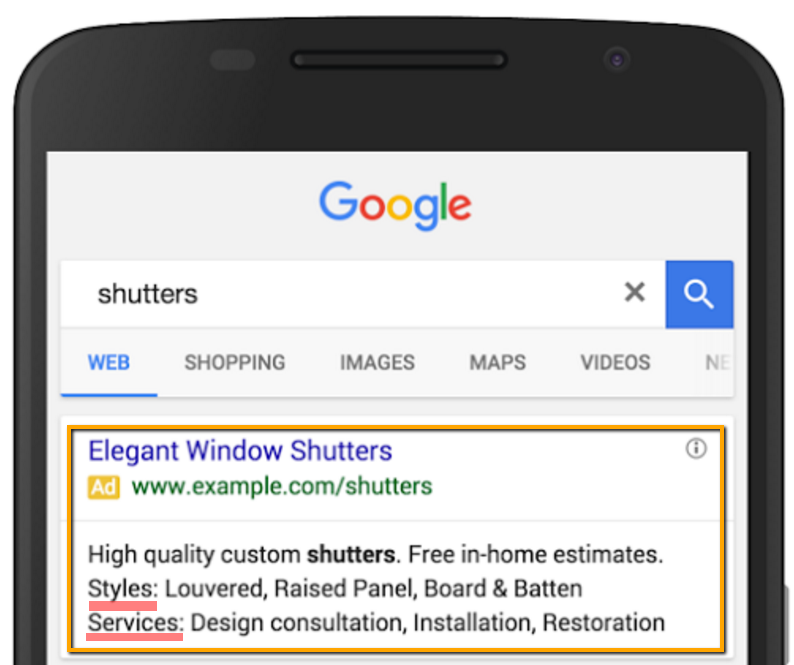 It is a second line of structured snippets that can be inserted into PPC ads. This new update gives ads more space in the search engine results pages and allows companies to callout different things about their business. Below, a shutter company, uses the headers “Styles” and “Services,” to highlight unique product offerings. This new ad format looks great, but what it will do to help your marketing and ultimately your business? Below are a few tips, benefits and structured snippets tests across PPC & SEO channels to highlight how this update will help drive more qualified conversions to save your business time & marketing spend. Industries that really benefit from this category extension are those that have a high cost per click. 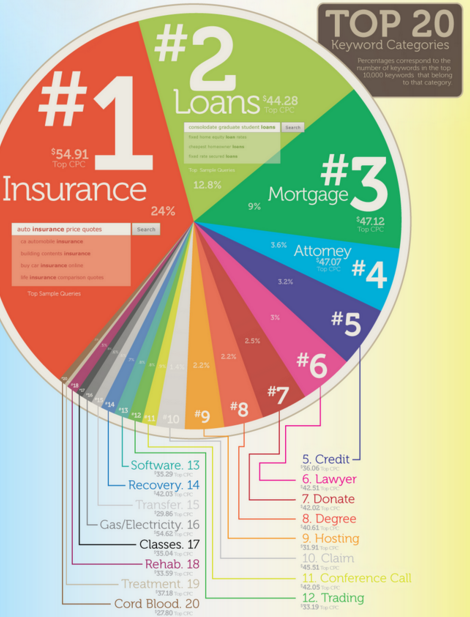 Insurance keywords are responsible for 24% of Google advertising revenue, which is most likely why “Insurance Coverage” was added as a distinct header. On the same note, 4 out of the 12 headers are related to travel, which also have historically high CPCs. In the future Google will expand the number of header options, but until then, advertisers have to get creative on ways we can utilize them. For instance, financial institutions could use the “Types” structured snippet for No-Fee Savings, High Interest Savings or list out the types of certificate of deposits they offer (3 month, 6 month, 12 month, etc). Your business may have one very well known product or service, but it’s struggling to get the word out about the additional items it offers. By adding structured snippets into your PPC ad account, you can use the new headers to bring attention to the business’ additional offerings. An example of this is Drexel Online. Many people know that they offer online bachelor’s programs, but everyone may not know that they also offer master’s programs and certificates. By utilizing structured snippets, Drexel can inform searchers about other aspects of their business. PPC continuously has the ability to test call to actions within search ads. With the new snippet feature, PPC ads can test more specific styles and service lines to hone in on the language and format that best connects with consumers. From these tests, your marketing team can vet the call to actions that convert the most, to identify what phrases and styles to use within SEO content, such as meta descriptions, headers, and call-to-action buttons. Google may still choose to create their own meta description based on the search term, but in many cases your well crafted meta description will now show up with an even better chance to convert due to the PPC tests. This extra PPC snippet will enable searchers to be better at self-qualifying themselves for your business. Let’s say you own a wedding dress company. If customers are looking for a specific type of wedding dress, for example, A-Line, Mermaid, Ballgown, Trumpet, etc. and it’s not listed in your snippet, they know not to visit your website. Great! One less unqualified person potentially filling out a contact form asking your team about it. There’s also a big cost-saving here. By having better pre-qualified leads coming to your site, it saves the call center or whomever reads submission forms time. If the call center charges per minute, every call – whether it’s profitable or not, costs your business money. However, if more incoming calls were qualified, the more profit you could get out of those calls. In addition, setting the expectation of what your site contains before the person clicks, will help ensure that customers never have a jaded customer experience. As structured snippets give you more room to discuss your business’ offering, it could prevent shoppers from leaving a poor/mediocre review because your site doesn’t have what they’re looking for. 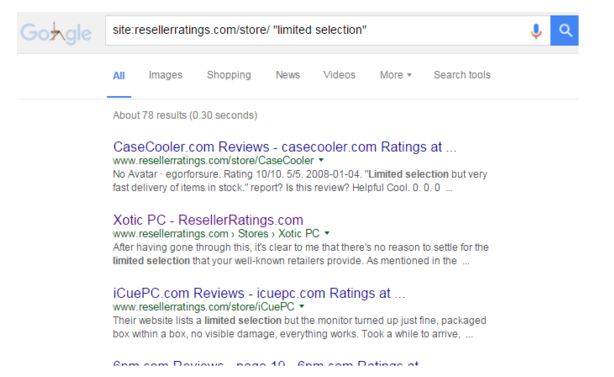 For example, when conducting a quick search on reseller.com ratings for “limited selection,” “small selection,” and “didn’t have,” we found time and time again that customers left mediocre reviews because the store did not carry the products that they had expected. 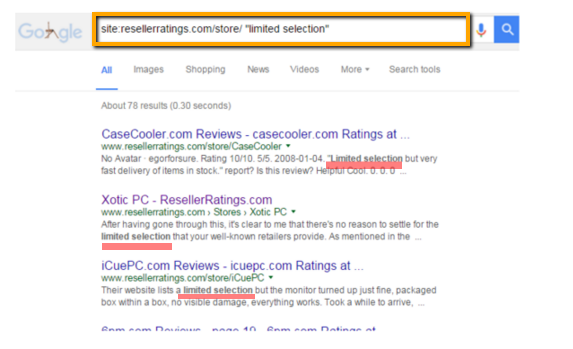 By using structured snippets, www.reseller.com could have set better expectations up front about what they do, and do not, carry, to avoid these negative ratings. Before I click on the product in the SERPs, I already know if it’s in stock, within my price range, how many people loved or hated it, and if a store is located nearby. Right now, these sitelinks indicate some categories, but do not touch upon all of business’ product offerings. It would be great to see a Style snippet in the SERPs before I click, indicating that RevZilla offers Motorcycle Touring, Half, Hi-viz neon, or race helmets as well as the categories pulled in through sitelinks. In the future, as Google aims to improve user experience, it seems very likely that Google will roll out a style snippet for organic results. If it does, you’ll already have PPC data to work with to know which Types or Styles convert the best for users interested in your products. While there are pros for both PPC and SEO with the new structured snippets, there is one aspect that makes organic SEO practitioners not so happy. With this additional line of structured snippets, paid search gains a new way to obtain more real estate in the SERPs, while simultaneously pushing organic results farther down the page. Contact us Today if you want to get your Paid Search up to date in 2016. Fill out the form on this page or give us a call! Make 2016 The Year of Marketing Intelligence. Understand what your marketing dollars are producing for you, identify waste & optimize your marketing efforts! Here John Bracamontes discusses what Acumen Studio does and how we can help you generate greater visibility online, generate new customers and more revenue. Recent findings show that the use of Display Ads in Digital Marketing for Insurance Companies is nine times more effective at generating awareness than television, print or radio. Another large reason that Display Advertising is so effective for insurance companies can be attributed to the ability to micro target and personalize. These more relevant and personalized approaches for display ads increase their visibility as well as drive action from those who are viewing successfully placed creative and messaging. To learn more about how we can drive greater awareness and new business for your insurance company, please call, email or fill out our online form. The fundamentals and core attributes of marketing apply to Certified Public Accountants just as they do any other industry, but with accounting firms, both large and small there are tactics that can generate massive success. One of those tactics is showing genuine personal attention to your clients. Sounds simple enough, but personal can be defined differently by most so we want to clarify what some of those effective personal touches are. Many CPA firms will send out direct mail to their clients that uses their name on the piece, that is great, but not the personal we’re talking about. Try sending out mail with handwritten notes that mention family or events. You can also make sure to send out anniversary cards, holiday cards, birthday cards with a dollar inside (or five) all with handwritten notes. The Certified Public Accountant needs to be marketing themselves 100% of the time. Something that can be overlooked is the expectation of a client that they are important (which they are) and the CPA needs to make them feel that way. Being enthusiastic when meeting with clients or on the phone, making eye contact and looking genuinely happy to see your client is critical to creating that personal relationship which can ensure that they are a customer for life. 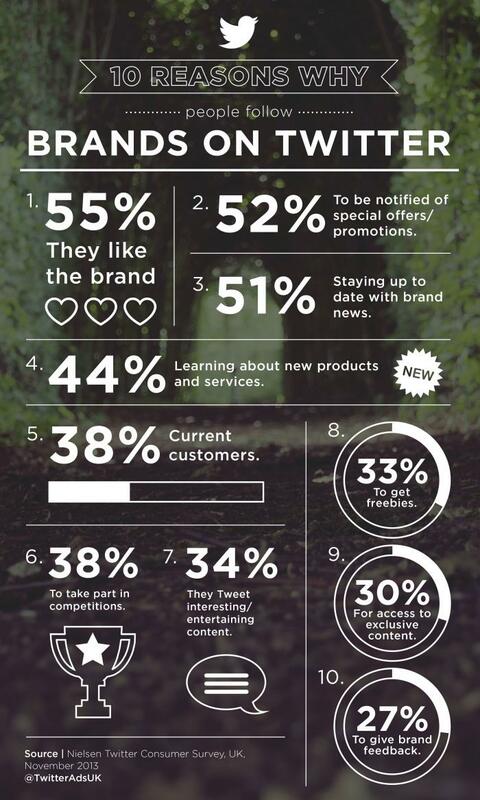 This type of personal attention can be showcased in marketing collateral, events and on digital channels. Use written and video testimonials, hold and highlight customer appreciation events such as galas, picnics or sports outings or hold contests that keep your clients engaged. All of these things can easily be communicated in newsletters, social networks, display ads, brochures, direct mail, television, radio, SEO, PPC and more. If you want to learn more about CPA (certified public accountant) Marketing contact us using the form to the right or giving us a call. Learn more about how we can help you with Digital Marketing specifically for Certified Public Accountants. The Connected World, Now commonly known as the Internet of Things is a large and growing area of M&A. M&A activity in the Internet of Things grew 45% from 2012 to 2013 and those numbers will continue to rise. 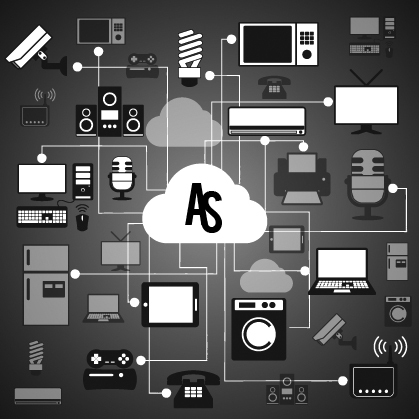 The Internet of Things is a web of physical objects and appliances that use the Internet to connect with other machines as well as the external environment. Connected Home, Connected Auto, Connected Everything! Not only are VC’s in the IoT space, but Strategic Investors are also present, knowing that they need to be here now to capitalize on these massive opportunities later. Check out more information on our Private Equity Marketing Services. 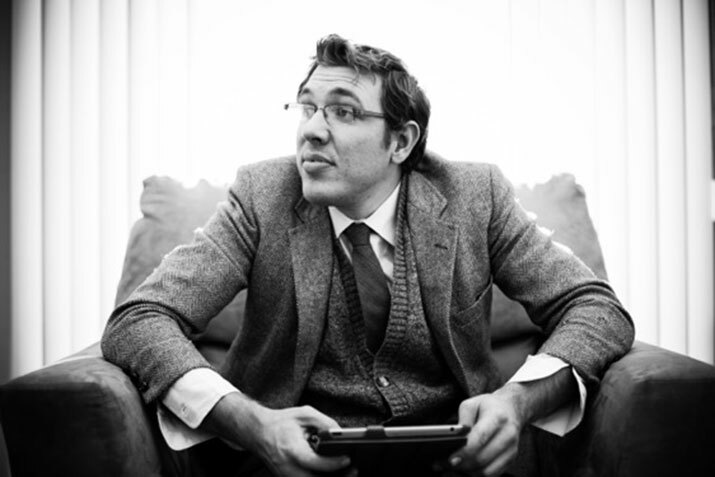 Want to to know more about the Real Advantage of Digital Channels for Financial Advisors? This Digital Financial Advisor Report provides insight into how Financial Advisors engage with online and offline media when conducting investment research, and how advisors are prompted to move through the decision process from awareness to recommendation / use of the investment product and on what type of materials & methods advisors use when communicating recommendations to clients. The Original Baby Boomers are a major force in Finance today. They are the Decision Makers and they have the Money. 1. Financially-Minded Boomers are better plugged in to the internet and search than their younger counterparts (Gen X and Y) when it comes to making financial decisions. 2. Search Engines and Social Channels are highly used to compare and narrow financial choices. 3. Sponsored links and videos are effective media vehicles that connect with financially minded boomers. These individuals are looking for resources online to help them make financial decisions and the presence of financial providers online gives those providers the ability to communicate the value of their services effectively as well as build credibility and trust. Fill out the form below to download our full study with statistics on how they engage, where and why. Why would anyone follow Financial Brands on Twitter? We have listed here a list of 10 Reasons why people do it.